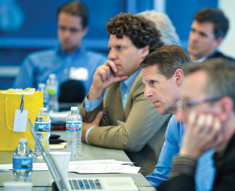 Since its inception in 2002, the U-M Tech Transfer National Advisory Board (NAB) has played a key role in guiding our strategies and operations. Composed of representatives from industry, the venture capital and entrepreneurial communities, government, and other university tech transfer offices, the NAB provides experience, expertise, and diversity for a valued outside perspective. Recent NAB projects include advising our catalyst talent initiative and helping to plan our new Venture Accelerator, which will be located in U-M’s North Campus Research Complex.